How is silence or, more specifically, the contrast between music and absence of music used in cinema as reflected in the cinematic output of a specific composer/director? It may seem curious to examine the use of silence, or, more specifically, scenes without music, in the study of film music. However, such an examination explores not only how music affects the drama in particular film scenes, but also how film and music can stand in for each other in their expressive effects. As film music properly serves the expressive purposes of the film, we shall explore how film too can be ‘musically structured’. To this end, I will examine the use of music versus ‘dramatic silence’ in the films of Alfred Hitchcock, particularly in Psycho (1960), and how this reflects on Hitchcock’s auteur theory of ‘pure film’. We will find that the aesthetic effect of music in dramatic film scenes is more complex than usually acknowledged. Movies are rarely devoid of sound, of course. By examining silence in film, I do not mean ‘silence’ in a literal sense. I mean, firstly, silence in the sense of the absence of diegetic music, but also, more broadly, silence as ‘dramatic silence’: a relative reduction or absence of sound on the film soundtrack which has a powerful effect upon the viewer. Walker and Daniel-Richard speak of certain moments or scenes in film in which this musicless silence may be “deafening”, yet clearly such dramatic moments are not achieved by simply removing all music from the soundtrack at whim. Music is generally considered an important even vital element in film expressivity. 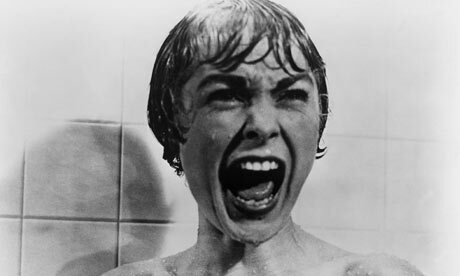 The power of the shower murder scene in Psycho, for example, is immeasurably enhanced by Bernard Herrmann’s music cue with its shrieking, stabbing string glissandi. This musical cue is so effective and iconic that the prospect that Hitchcock had envisaged the scene as not having music can seem surprising to many. Without the music, the shower scene is still powerful, but one senses a greater objectivity or grim ‘realism’, an enhanced aesthetic distance. With the music, it is decidedly more involving, more painful, more shocking; we feel a greater sense of identification with our murdered heroine. Similar effects can be observed in many other famous film scenes featuring iconic film scores – the shark attacks in Jaws, the space battles in The Empire Strikes Back, the journeys across the desert sands in Lawrence of Arabia. However, there are also many powerful film scenes which are not accompanied by music – the battle scenes of Saving Private Ryan, the initial Tyrannosaurus attack in Jurassic Park, the famous crop-duster chase in North by Northwest. Hitchcock and Herrmann famously had a falling out over the non-inclusion of music in another dramatic murder scene in Torn Curtain; indeed, the musical cue in this context does seem somewhat overbearing. Yet one might wonder why an added musical emotive or subjective intensity was not called for in this and other dramatically silent scenes. Hitchcock continuously presented such dynamic visual sequences without music in many of his earlier films. Examples include the knife murders in Blackmail and Sabotage, and the statue of liberty scene in Saboteur. Indeed, a number of his early British thrillers have very little non-diegetic music at all. These two contrasting effects of non-musical versus musical accompaniment – of distance, flat ‘realism’, and objectivity versus character-identity, interpretative force, emotive involvement and subjectivity – are commonly averred by viewers and film critics alike, yet contradictions abound. Gary Rydstrom, sound designer of Saving Private Ryan, argued that putting music under the film’s battle sequences would “take away the subjective feeling of it”, which is a total contradiction in light of the usual association between musical accompaniment and enhanced subjectivity. John Williams’ famous alternating-semitone motif orchestrates the shark attack sequences in the first half of Jaws, the music contributing to the suspense through its pulsating rhythm and primitivity. But Williams remains silent for a number of shark appearances in the second half (for example at 1:17:51), which could be said to be even more terrifying since the music does not foreshadow and essentially warn us that the shark is there. It seems that the presence or absence of music in a dramatic film scene does not totally guarantee any particular dramatic effect, or even whether such will be particularly effective. An equation such as ‘music equals subjectivity’ or ‘dramatic silence equals heightened intensity’ is too simplistic. Aesthetic philosopher Susanne K. Langer argued that the overall created completeness of a work of art is perceived as something other than the totality of the materials and effects that make it up, yet, counter-intuitively, is not separate from these elements. This may explain our musical conundrum here because, according to Langer’s insight, in the context of cinema, the numerous elements that comprise a movie – the actors, their performance, the lighting, the music, etc. – are, in an effective work, not perceived by the viewer as separate elements, independent ‘indicators’ of content or feeling, which must be logically ‘added up’ to produce the experience of the film. Instead, in an effective film, these film ‘materials’ are perceived by the viewer as blended into something resembling a single experience – of the film’s ‘world’ or mise-en-scene. By abstracting one element, such as music or dramatic silence, and analysing its function on its own, we overlook the illusion of totality which the viewer experiences. Marion reflects on her life predicaments in Psycho. Hitchcock clearly understood that effective use of music in film relies on this idea of contrast. He believed that every film should have a complete musical score: “Though by ‘complete’,” he added, “I do not mean continuous. That would be monotonous.” In employing dramatic silence, Hitchcock understood that, “its effect is heightened by the proper handling of the music before and after.” As an example, we note that this is particularly pertinent to Herrmann’s use of music in Psycho. Sullivan observes, for example, that, despite its reputation as a suspenseful film score, the music in Psycho appears, at times, to “relax rather than tighten dramatic suspense.” I think what Sullivan means is that Herrmann often uses slow, quiet, even delicate phrases and motifs as underscoring to various scenes throughout the film. This is music that does not appear on its own to be particularly shocking or even suspenseful. In fact, Herrmann’s score is astoundingly delicate and sensitive throughout much of the movie, something that is totally overlooked by film analysis which focuses more or less exclusively on his shower scene cue – which is a pity as I suspect that it is Herrmann’s almost psychological sensitivity that is actually where the real depth and effectiveness of his score resides. Consider the quiet and slow underscoring throughout much of the film, characterized by the cue entitled “Marion” in the opening scene (at 04:27). The music is eerie certainly, but it also expresses Marion’s depression with her current life and her troubling predicament. A similar very moving identification is conveyed by Herrmann’s “Madhouse” cue which appears when Norman explains to Marion his own sadness and frustration with life. This music does not “relax rather than tighten dramatic suspense,” it tightens the dramatic suspense by relaxing the viewer, or at least, by producing more contrasting effects so that the murder music, when it occurs, is all the more devastating. When it comes to dramatic silence, the use of music throughout Psycho also contrasts pointedly with the dramatic silence of the almost rhythmically-spaced musically unaccompanied scenes. This is best characterized by the dynamic “Prelude” music used beneath the Saul Bass title sequence. This music reappears almost mechanically whenever Marion is shown travelling on to the next destination in her misguided, ultimately tragic adventure, but it always emerges out of an ominous musical silence on the soundtrack – the dialogue scenes in between the travelling sequences are mostly starkly unaccompanied. The effect is almost musical in the alternation between travelling music and unaccompanied musical silence, almost as if the dialogue scenes are ‘verses’ to the travelling ‘chorus’ music. This creates a feeling of inevitable drive, culminating in the extremely ominous almost terrifying silence as the ‘Bate’s Motel’ sign appears through the rain and Marion’s windscreen wipers at 28:12. This contrasting silence is vital in the shower scene too, the horror of which is also enhanced by the music’s sudden emergence out of the musical silence (the quiet diegetic sound) that pre- and pro-cedes it: the sound of running water is almost as memorable as the musical cue itself. Hitchcock expounds the virtues of remaining silent. Such diegetic sound represents another factor influencing the power of non-musical silence: the capacity for other cinematic elements to ‘speak up’, as it were, and fill the musical void expressively. As observed by Hemmeter, this is particularly relevant to Hitchcock and his theory of ‘pure film’. Briefly stated, Hitchcock’s style evolved from silent cinema with its focus upon the visual rather than on spoken dialogue with stylistic techniques influenced by the Russian Formalists and their theory of montage. The result was a kind of cinema in which shot size and progression have dynamic effects. As Kulezic-Wilson observes, Hollywood had (still has) a fear of silence, expecting lack of music to guarantee an inert lifelessness onscreen which would hurt its box office takings. Composers and directors often complain about their unsuccessful attempts to convince producers to reduce the amount of unnecessary musical cues in their films. That Hitchcock could get away with dramatic silence in his climactic scenes not only speaks to the effectiveness of his technique but, I argue, to the virtually musical nature of his visuals. Hitchcock even describes his use of radically changing shot sizes as a kind of ‘orchestration’: “There is a bursting impact of images, like a change in orchestration.” “The effect is best illustrated by a parallel from music, namely in the sudden transition from a simple melody played on the piano to a sudden burst of music by the brass section of the orchestra.” “Indeed, orchestration is perhaps the best simile for film, even to the parallel of recurrent themes and rhythms. And the director is, as it were, the conductor.” I argue that Hitchcock does not need music for these scenes, because the effect of music is amply provided by his cinema techniques; music would, in many instances, simply duplicate the effects, perhaps muddying the expression, maybe looking silly with an inappropriate mickey-mousing effect. However, this extremely visual focus of Hitchcock’s style also resulted in a noticeable ‘void’ on the soundtrack which needed to be filled – with music or a form of dramatic silence. To conclude, we have seen how musical cues in film are enhanced and made effective through the holistic effect of contrast – not only musical contrast, but contrast with other similarly expressive elements within the film mise-en-scene. The element of dramatic silence in film is often unrecognised in film theory and criticism, along with its important role as a structuring element within the context of both the film score and the overall mise-en-scene. An appreciation of dramatic silence and its aesthetic dynamics may help to enhance future films, and not only their musical scores, but their overall dramatic power. I want to finish with an anecdote. For his final film Family Plot, Hitchcock chose to work with John Williams, a composer best known today for his enormous score for Star Wars (1977), a film which seems, what with its distinct lack of musical silences, to work on the opposite principle to the musical minimalism of Hitchcock’s cinema. Revealingly, Hitchcock and Williams had something of a disagreement over a particular music cue in Family Plot at 50:32. The scene involves a meeting between Adamson and his henchman Maloney. Adamson leaves the room as the police call on him. When Adamson returns to the room, Hitchcock cuts to a shot of the open window to indicate that Maloney has done a runner. Williams says he orchestrated a quiet musical build-up to Adamson returning to the room, then a brooding baseline after the reveal on the window. Hitchcock suggested he should drop the music altogether on the shot of the window because “the silence will tell us it’s empty, he’s gone, more emphatically, more powerfully, than any musical phrase.” This, I think, illustrates beautifully the effect of music and silence in film: not only ‘less is more’ but cinematic effects can ‘stand in for’ musical ones; the filmed image with silent soundtrack has itself become a musical player. Brown, Royal S. “Herrmann, Hitchcock, and the Music of the Irrational.” Cinema Journal 2 (1982): 14-49. Daniel-Richard, Debra. “The Dance of Suspense: Sound and Silence in North by Northwest.” Journal of Film and Video 62 (2010): 53-60. Film Music Notes. “Comparing Bernard Herrmann’s Psycho Score and Sinfonietta (1936).” Accessed 29 May 2014. http://www.filmmusicnotes.com/comparing-bernard-herrmanns-psycho-score-and-sinfonietta-1936. Hemmeter, Thomas. “Hitchcock’s Melodramatic Silence.” Journal of Film and Video 48 (1996): 32-40. Hitchcock, Alfred. “Film Production.” In Hitchcock on Hitchcock, edited by Sidney Gottlieb, 210-26. London: Faber and Faber, 1995. Originally published in Encyclopaedia Britannica, vol. 15 (1965), 907-11. Kulezic-Wilson, Danijela. “The Music of Film Silence.” Music and the Moving Image 2 (2009): 1-10. Langer, Susanne K. Feeling and Form. New York: Charles Scribner’s Sons, 1953. Langer, Susanne K. Philosophy In A New Key. Cambridge, Mass. and London: Harvard University Press, 1942. Lissa, Zofia. “Aesthetic Functions of Silence and Rests in Music.” The Journal of Aesthetics and Art Criticism 22 (1964): 443-54. Mamet, David. On Directing Film. New York: Penguin, 1991. Margulis, Elizabeth H. “Moved by Nothing: Listening to Musical Silence.” Journal of Music Theory 51 (2007): 245-76. Sullivan, Jack. Hitchcock’s Music. New Haven and London: Yale University Press, 2006. Sullivan, Jack. “The Music of Terror.” Cinéaste 32 (2006): 20-28. Truffaut, Francois. Hitchcock/Truffaut. New York: Simon & Schuster, 1984. Walker, Elsie. “Hearing the Silences (as well as the music) in Michael Haneke’s films.” Music and the Moving Image 3 (2010): 15-30. Watts, Stephen. “On Music In Films.” In Hitchcock on Hitchcock, edited by Sidney Gottlieb, 241-45. London: Faber and Faber, 1995. Originally published in Cinema Quarterly 2 (1933-1934): 80-83. Winters, Ben. “The Non-Diegetic Fallacy: Film, Music, and Narrative Space.” Music & Letters 91 (2010): 224-44. See Elizabeth H. Margulis, “Moved by Nothing: Listening to Musical Silence,” Journal of Music Theory 51: 245; Danijela Kulezic-Wilson, “The Music of Film Silence,” Music and the Moving Image 2 (2009): 2; Thomas Hemmeter, “Hitchcock’s Melodramatic Silence,” Journal of Film and Video 48 (1996): 40 (footnote 1); Zofia Lissa, “Aesthetic Functions of Silence and Rests in Music,” The Journal of Aesthetics and Art Criticism 22 (1964): 443. Elsie Walker, “Hearing the Silences (as well as the music) in Michael Haneke’s films,” Music and the Moving Image 3 (2010): 17; Debra Daniel-Richard, “The Dance of Suspense: Sound and Silence in North by Northwest,” Journal of Film and Video 62 (2010): 59. Jack Sullivan, “The Music of Terror,” Cinéaste 32 (2006): 22, 23; Royal S. Brown, “Herrmann, Hitchcock, and the Music of the Irrational,” Cinema Journal 2 (1982): 15. Brown, “Music of the Irrational,” 15. Note that I am not necessarily suggesting that Herrmann’s music was rejected because it fails to be effective in this scene, or in the movie in general. It seems more likely that Hitchcock rejected the score because he was being pressured by the studio to adopt a lighter ‘popular style’ score which Herrmann was not able or willing to provide (Brown, “Music of the Irrational,” 44). I am not concerned with such historical, biographical or economic explanations for aesthetic decisions in this essay as I am primarily concerned with the function of the music as presented. Hemmeter, “Hitchcock’s Melodramatic Silence,” 32. Sullivan, “The Music of Terror,” 23. Sullivan discusses these in a chapter entitled “Musical Minimalism: British Hitchcock” (39-57) in Jack Sullivan, Hitchcock’s Music (New Haven and London: Yale University Press, 2006). Walker, “Hearing the Silences,” 18-19; Kulezic-Wilson, “The Music of Film Silence,” 1; Brown, “Music of the Irrational,” 15; Claudia Gorbman, “Narrative Film Music,” Yale French Studies 60 (1980): 193. Rydstrom in Gianluca Sergi, The Dolby Era: Film Sound in Contemporary Hollywood (Manchester, 2004), 178, quoted in Ben Winters, “The Non-Diegetic Fallacy: Film, Music, and Narrative Space,” Music & Letters 91 (2010): 230. Susanne K. Langer, Feeling and Form (New York: Charles Scribner’s Sons, 1953), 47-48. Langer’s aesthetics leans heavily upon traditional music theory and analysis as reflected in the title of her most famous work, Philosophy In A New Key (Cambridge, Mass. and London: Harvard University Press, 1942). Walker, “Hearing the Silences,” 18. William Alwyn in Ian Johnson, William Alwyn: The Art of Film Music (London: Boydell Press, 2005), quoted in Kulezic-Wilson, “The Music of Film Silence,” 5. Hitchcock quoted in Stephen Watts, “On Music In Films,” in Hitchcock on Hitchcock, ed. Sidney Gottlieb (London: Faber and Faber, 1995), 242. Sullivan, “The Music of Terror,” 25. See Psycho, 38:58. The extraordinary depth of this theme is, I suspect, the principle source of psychological depth in the film and possibly the greatest contributor to the effectiveness of Psycho. Herrmann virtually lifted the entire theme from his 1936 Sinfonietta for Strings, suggesting this music was both dear to him and probably not easy to whip up quickly for a film score. See also “Comparing Bernard Herrmann’s Psycho Score and Sinfonietta (1936)”, Film Music Notes, accessed 29 May 2014, http://www.filmmusicnotes.com/comparing-bernard-herrmanns-psycho-score-and-sinfonietta-1936. Or, if you like, a kind of rondo form is implied. Hitchcock denigrated early sound cinema arguing that films had degenerated into poorly expressive ‘pictures of people talking’ (David Mamet, On Directing Film (New York: Penguin, 1991), 22). See Francois Truffaut, Hitchcock/Truffaut (New York: Simon & Schuster, 1984), 214-16. Kulezic-Wilson, “The Music of Film Silence,” 1. Kulezic-Wilson, “The Music of Film Silence,” 3. Alfred Hitchcock, “Film Production,” in Hitchcock on Hitchcock, ed. Sidney Gottlieb (London: Faber and Faber, 1995), 216. Gorbman, “Narrative Film Music,” 193. John Williams speaking in the documentary Plotting Family Plot, dir. Laurent Bouzereau, 2000: 40:50-41:53.